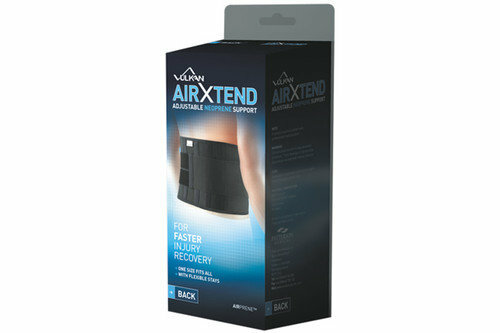 Accelerate your healing process and get back in action with the Vulkan Airxtend Back Support. Recommended for back sprains and strains, moderate disc and arthritic conditions, sciatica, muscle spasms and strains of the sacroiliac area, the soft neoprene helps retain heat at the source of the injury by increasing blood flow and oxygen to the damaged tissues. A simple concept which sees the support designed with a tapered cut and flexible stays to allow for adjustable levels of support.